The Ole Miss Alumni Association announced its officers for 2017-18 on Saturday (Oct. 14) as part of Homecoming festivities on campus. Bobby Bailess (BBA 73, JD 76) was named president, a one-year term that changes each Homecoming. Bailess is a lifelong resident of Vicksburg, practicing law there since 1976. “I am so humbled and honored to serve the Ole Miss family. Natalie and I look forward to working with and getting to know more of the alumni, faculty, students and friends of this great university,” said Bailess. 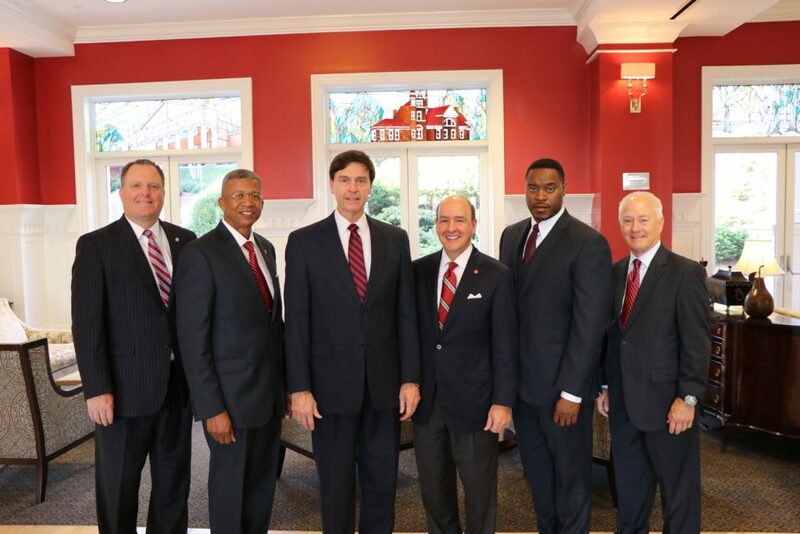 From left, Kirk Purdom, Leon Collins, Bobby Bailess, Matt Lusco, Deano Orr and Andy Kilpatrick are the Ole Miss Alumni Association officers for 2017-18. Bailess was a three-year letterman for the Rebel football team from 1971 to 1973. He is a Fellow of the Mississippi Bar Foundation and served as a member of the Board of Trustees of the Foundation. He is past president of the Mississippi Bar Association, a member of the Lamar Order, and served as chairman of the Law Alumni Board. He and his wife, Natalie (BAEd 73), have three children, Russ (BBA 99, MBA 01), Katherine, and Becca (BAEd 07), and four grandchildren. “I know that Bobby and Natalie Bailess will serve Ole Miss and the Alumni Association with grace and enthusiasm,” said outgoing Alumni Association President Hal Moore (MD 76) of Pascagoula. Retired Major Gen. Augustus Leon Collins (BBA 82) of Madison, chief executive officer for MINACT Inc. was named president-elect. Matt Lusco (BBA 79), of Birmingham, senior executive vice president and chief risk officer for Regions Financial Corp., was elected vice president. Athletics Committee members include Andy Kilpatrick (BBA 87) of Grenada and Deano Orr (BBA 93) of Bartlett, Tennessee. Kilpatrick serves as counsel for the Mississippi State Board of Architecture. Orr serves as executive director of International Paper Foundation in Memphis. Ole Miss Alumni Association Executive Director Kirk Purdom (BA 93) serves as treasurer.